Remote desktop – does the term sound familiar? Generally, the term “remote desktop” indicates the process of using someone else’s computer from another distant system connected via the internet or in any way. This can be a very interesting thing for lots of reasons. Sometimes, it can be life-saving and sometimes, it can be disastrous. For the enterprise level, the remote desktop connection is more necessary than anywhere. 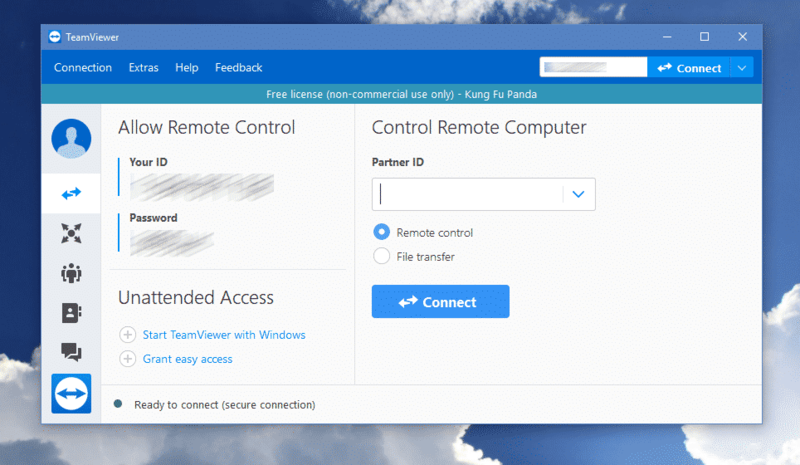 So, why do we need to have the facility of remote desktop control? In some cases, there may not be anyone nearby available for fixing a PC problem. Now, let’s say you have a friend or a support technician on the line for solving the issue. There can be numerous other scenarios like above that may require unattained access to your system. In this case, the friend/technician or others gain access of the system for a certain amount of time. After doing the job, it’s complete! It’s more important for the enterprise and technical level where things can get pretty messy quite easily. In the professional workspace, you may need to work on several sessions that, if effectively managed, will offer a HUGE boost in productivity and performance. With a remote desktop at hand, you can seamlessly switch from one system to another. With each instance at hand, you can directly perform different tasks on each of them. In the remote desktop, it’s possible to reduce the costing DRAMATICALLY. The same machine can be used among a number of users; no need to get individual software and machinery. For example, take Microsoft Office Suite into account. With remote desktop, multiple people can work on the same machine, using the same software! No need to purchase for individual MS Office Suite while enjoying the full features completely LEGALLY! This is the aspect I prefer the most. Using a remote desktop connection, you can directly access your workstation from anywhere, anytime. All you need is just allowing remote desktop connection with suitable software and an internet connection. 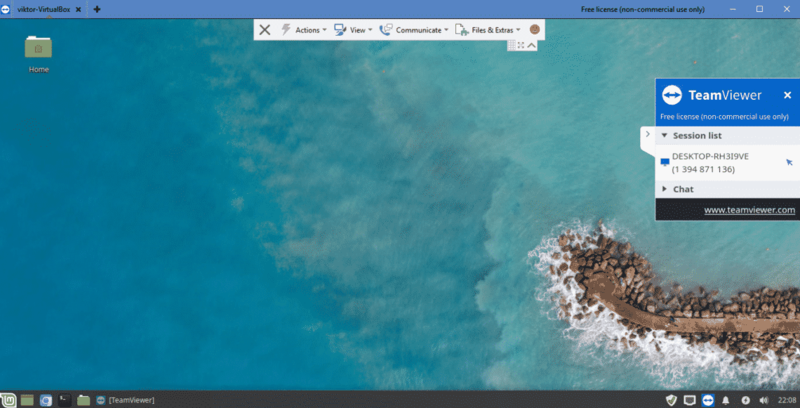 The remote desktop connection is, undoubtedly, a powerful tool that’s really valuable in tons of situations. However, it’s never without issues and because of its nature, the remote desktop connection can be pretty dangerous. The first and foremost important thing is security. You’re allowing someone else into your system. In fact, you’re giving the power of even the most critical abilities. A crook with such ability can easily perform illegal actions on your system. So, make sure that you’re allowing someone who’s trustworthy. You also need a safe internet connection for the purpose. If there’s someone snooping on you via the network, it’s possible to modify the network data and result in a real mess. Moreover, the network shouldn’t become a bottleneck for the remote desktop connection. If the network is a bottleneck, then the overall experience and performance will be lowered to the worst. Now, whenever we’re talking about the remote desktop, the first thing that crosses our mind is the TeamViewer. It’s a powerful and popular software that allows secure remote desktop connection in an easy manner for all types of purposes – personal, professional and business. 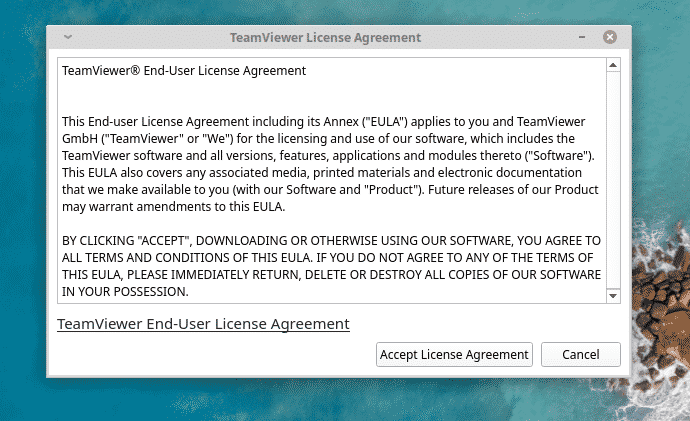 In the case of TeamViewer, it’s free for personal usage. For the paid plans, the price is also extremely affordable and cheap despite providing so much feature. It’s safe, fast and above all, reliable. TeamViewer has earned its name in the sector as one of the finest remote desktop services of all. Let’s check out TeamViewer Linux Mint – one of the most popular Linux distros of all time. 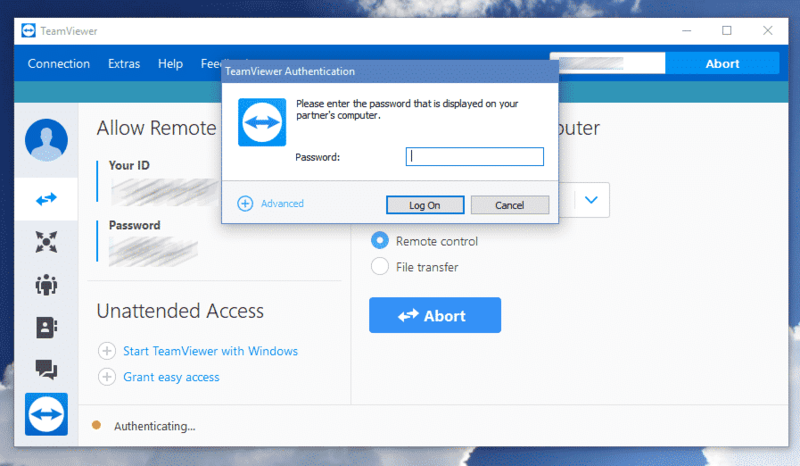 Get TeamViewer from the official site. Start downloading the DEB package of TeamViewer. Did you notice that I’m using APT for doing the installation job? It takes care of the dependencies during the installation. Voila! 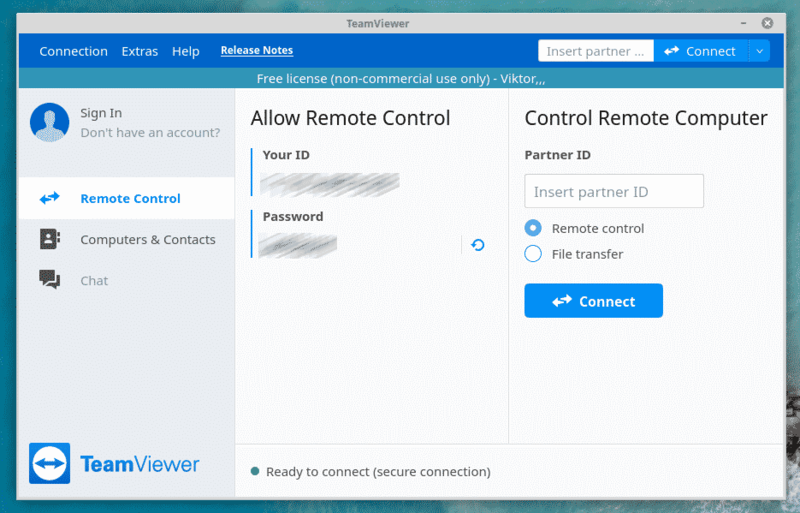 TeamViewer is ready to use! If you want someone else to connect to your system, then you have to provide him the ID and password. For example, I’m on my Windows system and I wish to connect to my Linux machine. Voila! I’m accessing my Linux machine directly from my Windows machine! So, a new lesson for me – NEVER access the host system via TeamViewer while you’re using VirtualBox! 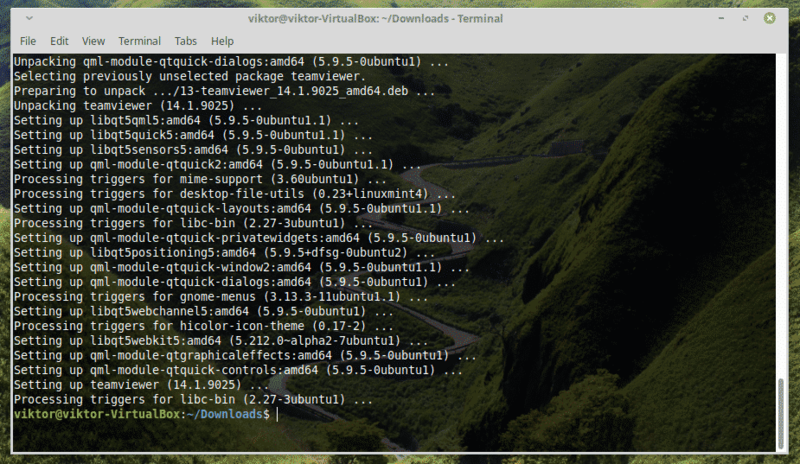 Learn how to install Linux Mint on VirtualBox.